Place the sliced apples in a 9×13 inch pan. Mix the white sugar, 1 tablespoon of flour and ground cinnamon together. Now sprinkle that over the apples and pour water evenly over it. Next, combine the oats, 1 cup of flour, brown sugar, baking powder, baking soda, and melted butter together. Once that is all together crumble evenly over the apples. Dogs can help in many ways with anxiety and depression. 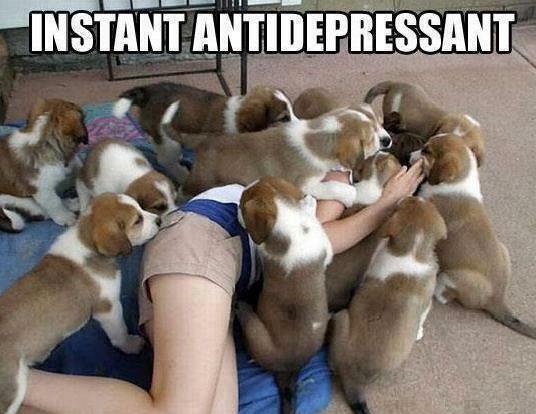 They help release hormones like serotonin, oxytocin, and stop too much of cortisol. Serotonin is a hormone that makes you happy and without enough of it you can feel depressed or anxious. Oxytocin is known as the love hormone; as it is released by hugging or cuddling. This can help someone relax and not feel so anxious. Cortisol is released when you are mentally stressed. By having too much it will become unhealthy and cause depression and anxiety. Of course there are more hormones that helps, but those are just three of them. Here below is a list of things dogs do to help. Dogs will make you get out of the house by needing exercise. Then you can not isolate yourself from the world. By having a companion always there for you. Dogs are very loyal and will simply love you. When petting or cuddling with your dog, this will help with anxiety and depression. Of course the dog will love it too. They help cope with life problems. Instead of stressing on something 24/7 a dog can get your mind off of it and do something else. You have to take care of the dog, so being depressed you could feel important and wanted then. A dog will know when you are not feeling good from being sick to upset to sad. This helps you feel understood by someone and maybe have a relaxing day with the dog. Even being in a horrible mood I am sure they can make you smile.